Silver State 50K Race Report… my hometown race!! Friday night before Silver State 50K I stood over the stove pouring brown rice pasta into my yummy little tomato sauce/chicken concoction while having a glass of wine. In my mind, I was only cooking dinner to serve to the two runners racing a 50 miler in the morning- my husband, JB and our friend, Tim Olson. I even scaled down my portion as I thought the likelihood of 1) getting a babysitter was not favorable and 2)my runner body seemed a little beat down from Miwok only two weeks prior. As we ate dinner and enjoyed a casual evening, the thought of not running Silver State 50k, which was in my backyard afterall, just worked on me little by little. I made a phone call to my sister, who after hearing she would need to be to my house by 6:00am, reluctantly, but sweetly agreed to watch Eva. I told her I promised I would be home by 1:00pm which would give me about 6 hours or less to run the race and drive home. Okay, what had I done? Did I really need to go race again. Yes, it seemed I did. Morning came, Eva and I were up early as usual and I hurried to get myself to the race. I arrived and signed up with only 2 minutes to spare. I found my new running friend, Gretchen Brugman, who I just met at Miwok and said a quick hello. We both agreed our legs were tired from Miwok and then off we went as the RD told us “Go! !” I settled in to a nice pace and saw that rain was threatening in the distance. After I shook my legs out for about 4 miles, I realized I didn’t feel all that bad. I looked down at my Garmin and found I was moving at a decent clip, so onward I went. As the real climbing towards Peavine began, the better I felt. Climbing is kind of my comfort zone and I can usually catch up or pass on the hill. I just got into the zone and did exactly that. I won’t bore you with the details of every aid station, mileage, what I ate,ect. Mostly because I don’t really remember it all. I just ran that day and pretty mindlessly at that. I turned up my music, tried to keep a steady pace, drank my water and enjoyed some new trails. What I do remember is how I used my pseudo-jedi mind tricks to get over the fact that my body was hurting at times, not nearly recovered from 11hours at Miwok. I think I realized after all these years that I can push pain out of my mind even if only for moments at a time. I enjoy overcoming the lows and just riding out the highs. At least this was the case for this race. I crested the last hill and saw Rancho San Rafael park in the near distance and just pushed to get across the line. Someways back a few people had told me I was running as 2nd woman and so I was hoping that would be the case upon arrival at the finish. 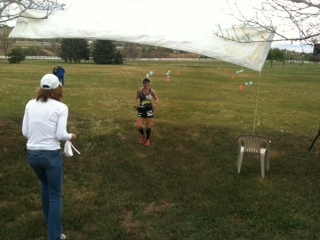 A 5:15 finish time and yeah, good enough for 2nd women and 7th overall. My dad and JB were waiting for me with an ice cold coke (I was hoping for a beer) and I was all smiles, happy to be done. I quickly got in the car and got home by 12:45, where Eva was squealing in delight. Only 6 weeks to Tahoe Rim Trail 100 and so time to ramp up training just a bit more in hopes the lows will be even fewer and the highs will be really high. I was so excited to get into Miwok. Despite it being my backyard until recently, I never had the chance to run this 100K race that might also be billed as the most competitive and prestigious 100k in the country. For good reason too, its a great primer race for Western States, or any other 100 mile summer race, it has completely runnable trails, great scenery, an immensely deep field of runners, first class race organization and aid stations that are pretty much spot on. Standing on Rodeo Beach moments before the start, I had only a few thoughts- that of my baby girl and also reminding myself to take my time on the first half. My plan was to just enjoy the run, see how my training was coming along and answer the question of how my 7.5 month post partum body would respond to this distance. We were quickly sent running at 5:40am, just as dawn decided to peak out from behind the San Francisco skyline onto the bay. The morning was cool, crisp and with a light tailwind to help push us up Conzelman road, the first of a few nice climbs all stacked in the front of the race. I felt good and settled in with my wingman, Carly Koerner. We chatted and laughed and just generally had a nice easy rythym going. We met other runners and then found ourselves to some single track and then down to the first aid station at mile 7. Then began another climb to the top of Wolf Ridge. Then a super fun and speedy descent to Tennessee Valley where my little Eva and JB were waiting for me with smiles and waves. I even got to give Eva a kiss as I grabbed my Nathan pack. Now here’s where I can say my race plan was different than anybody else’s. See, I had to devise a plan to take care of a ticking time bomb that most would not have to worry about- lactation. So I found the lightest, smallest manual breast pump on the market and took it along for the climb to Pan Toll, where I would walk and pump. It was pretty hilarious as I warned the runners around me as I began this exercise. Luckily for me, I was surrounded by understanding and awesome women runners- Carly, Larissa Polishuck, Betsy Nye and Sarah Crosby-Helms. I am sure it was a pretty rediculous sight for them all to see. But it worked so well and when I say I felt lighter, I am not kidding. Pan Toll aid station came quickly and brought another chance to see Eva and JB. As we cruised out to Bolinas Ridge, around mile 27, I was feeling still quite good and was just having a steady run. I remember thinking that the way back to Pan Toll on that somewhat monotonous single track would be possibly a mental killer for me as it seemed to take forever. Leaving Bolinas aid station and heading the 5.5 miles down to Randall Aid station I was trying to focus on my race, but I loved seeing the front runners coming back. Watching the sizable lead men’s pack of 5 or 6 was just insane, and I cheered them on as they passed by. I also couldn’t help but notice where I was in the women’s pack. By the time I got down the hill I was postioned into 16th place. I felt a little discouraged, but again, I reminded myself this was just me running to my music, my thoughts and working back into big distance. “Chill out girl,” was my mantra until the turnaround. Then something happened. It was as if a magnet was on my chest pulling me home. I realized I was asking a lot of my legs to pick up the pace after already having run 33 miles, but I decided it wouldn’t hurt to ask. Scott (Jurek) and I talked pre-race about me trying to run a negative split and just reel it in after Randall and well, I guess I decided to listen. That’s when I pretended I was fresh, even invincible. I clicked the volume up on my ipod, took some deep breaths and just cranked up the speed. I must have passed 12 or more runners after Randall aid station on the way to Pan Toll. I was reminded of a line David Horton would always say- “there isn’t much better then being in shape, cruising in the mountains.” That seemed to be true for me until mile 51. when I was hit with a major low point due to GI issues and losing my breastpump. I was reduced to a couple minutes of walking to deal with both issues, neither of which need to be discussed in any detail. LOL. Finally, after leaving Muir beach aid station at mile 52 and heading to Pirates Cove, and up those damn steep stairs, I was kind of in the hurt locker. I crested the hill and standing there was JB, and Eva in her jogging stroller. I could see Tennesse Valley was only about 2 miles below. Seeing Eva with her big blue eyes and JB pushing her, giving me encouraging words was just the trick. As we descended together down the trail, and heading into Tennesse Valley, a very sleek bobcat was cruising the paved road, seemingly oblivious to the crowd that had formed around it. JB snapped some pictures and I just took in the cat from a distance as I kept running by. The only thing I could focus on was the 5.5 miles to the finish line. And a fast 5 miles they were. I cruised up Old Springs trail and down my favorite steep Miwok trail trying to catch the always fast, Clare Abram ahead of me. I just couldn’t close the distance, but sure had fun trying. I crossed the line in 11:03, good enough for 12th female overall. I ran almost an hour faster on the second half of the course and was just thrilled with the day. I was so happy to hold Eva in my arms and eat a chicken sausage hot dog, I thought things couldn’t get any better. But I guess they did, because my first Mother’s Day was celebrated the following day at brunch with my family and the Koerners. A mimosa toast to the mamas, the runners and the crew. Thanks to Tia for an amazing race and to JB and Eva, my awesome crew and now my new, mini-pacer. I can’t wait to run that one again. Maybe next time Eva can run me into the finish.